This was photographed and uploaded to Flickr by Jason Liebig. Hipsters gonna hipst, but I occasionally had McDonalds (and Burger King) breakfasts. The graphics, type, and logos on the cups are all so amazing. 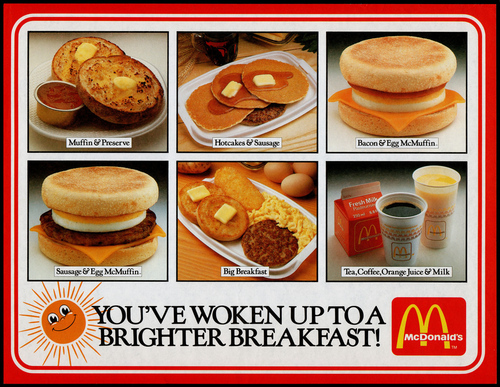 McDonalds Trayliner Placemat - You’ve Woken Up to a Brighter Breakfast - 1980s. Feauting the whole assortment of breakfast items available at the time is this cleanly-designed trayliner.